Kia ora and welcome to term 1! We are excited to be planning another great year with Organic Kids. 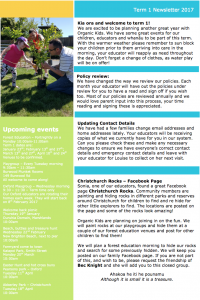 We have some great events for our children, educators and whanāu to be part of this term. With the warmer weather please remember to sun block your children prior to them arriving into care in the morning, your educator will reapply as need throughout the day. Don’t forget a change of clothes, as water play will be on offer! We have changed the way we review our policies. Each month your educator will have out the policies under review for you to have a read and sign off if you wish too. Most of our policies are reviewed annually and we would love parent input into this process, your time reading and signing these is appreciated. We have had a few families change email addresses and home addresses lately. Your educators will be receiving copies of what we currently have for you in our system. Can you please check these and make any necessary changes to ensure we have everyone’s correct contact details and emergency contact details and leave with your educator for Louise to collect on her next visit. Sonia, one of our educators, found a great Facebook page Christchurch Rocks. Community members are painting and hiding rocks in different parks and reserves around Christchurch for children to find and re hide for other little explorers to find. The locations are posted on the page and some of the rocks look amazing! Organic Kids are planning on joining in on the fun. We will paint rocks at our playgroups and hide them at a couple of our forest education venues and post for other children to find them! We will plan a forest education morning to hide our rocks and search for some previously hidden. We will keep you posted on our family Facebook page. If you are not part of this, and wish to be, please request the friendship of Bec Knight and she will add you to this closed group.